I went to the ophthalmologist for another check yesterday. It’s a very inconvenient appointment because I need someone to drive me. The exam involves numbing drops that dilate your pupils, which means you can’t focus and the world is a blur for a few hours. You clearly can’t drive. Anyway, my eyes are fine. The black floaters are not dangerous. There is no damage to my vision; I just need to keep using lubricating drops daily. Probably forever. Just another bit of maintenance. But it got me thinking again about all the complications and comorbidities of Rheumatoid Arthritis. Like iritis. Previous articleShould you exercise with Rheumatoid Arthritis? Next articleWhat does a Rheumatoid Arthritis flare feel like? Thank you so much for writing about this, there is so little information out there on Uveitis, most RA sites don’t mention it. 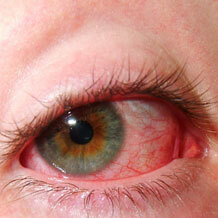 Allergies and maybe am infection in my eye. He told me to go to your web site and read more.